Sign-up Date: Deadline is 2 weeks prior to class. Please register now. Space is very limited and sells out quickly!!! Description: Learn the basics or enhance your experience with further instruction by a PSUPA Certified Professional of Salmon Bay Paddle. Learn additional stability, strokes, and techniques out on the water to explore and tour the waterways of Puget Sound. Work out your entire body and enjoy the outdoors while you practice your learned techniques on the water. Please contact Wellness Director, Kendra Kainz (kkainz@sacdt.com) to register and/or further information. What is the SAC Ragnar Relay Team? 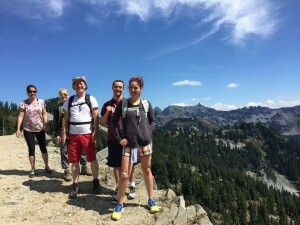 It’s a co-ed team of 12 people, running relay style from Blaine, WA to Langley, WA. The team will complete 196 miles of scenic terrain over two days and one night, until the entire team crosses the finish line together! One runner hits the road at a time. Each participant runs three times, with each leg ranging between 3-13 miles and varying in difficulty. Runners average about 17 total miles. While one person runs, teammates are on support duty in their race vehicles. As each runner begins, the crew in the vehicle can drive ahead, cheer their runner on, and meet them at the exchange point to pick them up and drop off the next runner. Some distance running experience is required. Don’t worry about speed or pace. We are more interested that you have a fun and positive attitude! You will have an amazing team bonding experience. For more information, please contact our Wellness Director and run coach, Kendra Kainz at kkainz@sacdt.com. Thank you to all that joined me on my first “lead” hiking club expedition, not only did we get in shape but created lasting memories. The Club was a wonderful way for people to make new friends and for those to experience something new. 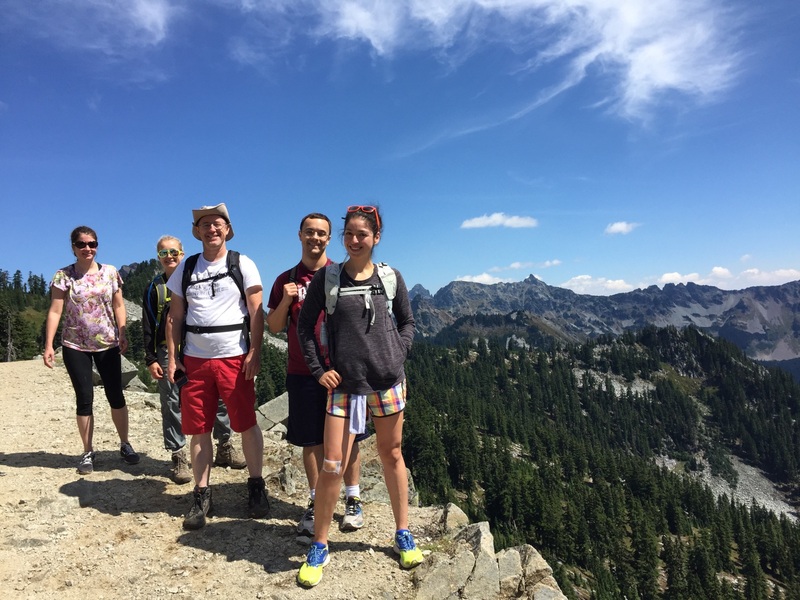 One member conquered her fear of hikes on the Kendall Katwalk, another couple stepped out of their comfort zone and tackled a 9 miles 3000’ elevation gain at Lake Serene (WHOAH! ), and I fell even more in love with the Pacific Northwest. The enthusiasm, the laughs, and sometimes grunts as we tackled the last few hills were all worth it in the end when we experienced that “top of the world” view as a team, which is why I love what I do and can’t wait till next year. Once again, we had SO. MUCH. FUN! 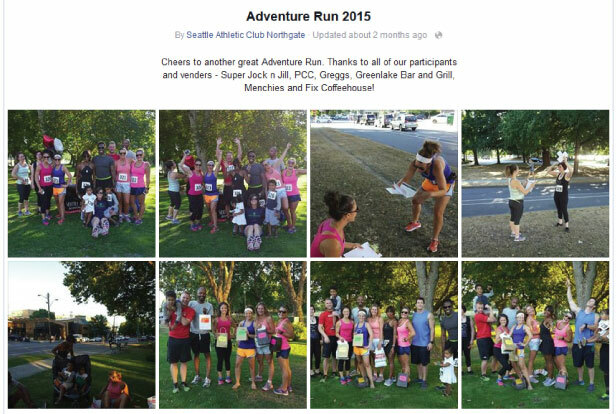 A big thank you to everyone who participated in our second Adventure Race around Green lake on Friday, July 31st. Teams of two ran and explored all corners of the Green Lake area while challenged to solve clues, find checkpoints and perform dares. A big thank you to all of our supporters – Super Jock n Jill, PCC, Greenlake Bar and Grill, Menchies at Greenlake, and Gregg’s Cycle. Without them, we wouldn’t have had such an exceptional event AND prizes! Everyone finished with a smile and a little sweat so fun was had by all and we got to check it off as a workout. REGISTRATION: All Personal Watercraft must be registered with the State of Washington and the operator must have available for inspection the vessel registration (similar to a car registration). SPEEDING: Vessels are limited to a maximum speed of 7 nautical miles per hour (8mph): within 100 yards of any shoreline, pier, shore installation or restricted area in Lake Washington. Within 200 yards of any shoreline upon Puget Sound. Upon all the waters of Lake Union, Portage Bay, Union Bay and the Lake Washington Ship Canal from Shilshole Bay to Webster Point. PERSONAL FLOATATION DEVICE (PFD): Operators and passengers must wear a U.S. Coast Guard approved personal flotation device or life vest. VESSEL NUMBERING: All Personal Watercraft must have registration numbers, in contrasting colors, displayed on both sides of the forward section of the hull. (A yearly decal must be displayed in conjunction with the numbers). AGE LIMITS: The operator of a Personal Watercraft must be at least 14 years of age. It is unlawful for a person to lease, hire or rent a Personal Watercraft to any person under 16 years of age. FIRE EXTINGUISHER: Every Personal Watercraft must be equipped with a Fire Extinguisher (usually carried in a compartment at the rear of the machine). NEGLIGENT OPERATION: Operating a vessel in a manner so as to endanger or likely endanger any person or property or operate at a rate of speed greater than will permit him/her to exercise reasonable care or control of the vessel. (Such as wake jumping too close to boats, speeding too close to other vessels, the shoreline, swimming beaches or launch ramps). MUFFLER: It is unlawful to operate any engine on the waters of the city of Seattle without a muffler or silencer of sufficient size to prevent excessive or unusual noise from the exhaust of the engine. HOURS OF OPERATION: Personal Watercraft may be operated from sunrise to sunset. Use protective equipment: Wear your PFD but also use eye protection, gloves and deck shoes. A wet suit will help protect against hypothermia. Use care when wake jumping. Stay well clear of other vessels. Wake jumping produces a large percentage of the complaints of negligence directed at personal watercraft operators. It also accounts for a number of injuries incurred by personal watercraft operators. Don’t Drink and Ride: Alcohol and drugs affect your judgment. The added affect of sun and physical exertion compounds the effects of alcohol and increases your risk of being involved in an accident. Lanyard: Wear the kill-switch safety Lanyard when operating your personal watercraft (PWC). The Lanyard attaches to the operator and the vessel to automatically shut off the engine if the operator is separated from the craft. Irresponsible acts by a few operators and careless operation by new or uninformed riders and owners have resulted in numerous boating accidents throughout Washington State. Most of these accidents involve injuries and some have resulted in death. Accidents involving Personal Watercraft have almost doubled in the last few years. Spring is here and there’s no better way to get out and enjoy the sunny Seattle weather than to do so while working out! Don’t snub the outdoors for your routine weight lifting program in the gym. You’d be surprised how easy it is to get a full body workout done sans gym equipment. Plus, think about all of the extra Vitamin D you’ll be soaking up while you exercise. Another benefit of exercising outside is that it’s different. We are all creatures of habit and often shy away from the unknown. What many people don’t realize is your body craves variety. Too much of one thing is never good. Switching up your usual exercises with an entirely new program not only fights boredom, but also prevents your body from reaching a plateau. That being said, here’s a quick circuit to help get you started with something new outdoors. All you need is a playground and a little creativity. Time to kick into gear, no excuses! Keeping your core engaged, pull both knees up towards your chest contracting your abs. Do not swing legs up or arch your lower back. Tip: be sure to keep your shoulder blades down and back throughout the whole movement. Propel straight up bringing your opposite knee up towards your chest. Jump as high up as you can. Tip: Make sure you push your weight through the heel of the foot on top of the bench and keep your knee behind your toes. To modify, perform the exercise without the jump. Start with hands shoulder width apart and body right next to the edge of the bench. From the ground, jump straight up gripping tightly on the bar and pulling your body up as high as you can. Sit back on your standing leg, pushing your weight into the heel and keeping your knees behind your toes. Lunge back as low as you can, aiming to get the thigh of your standing leg parallel with the floor. Tip: Avoid bending forward too much; focus on keeping your chest and chin up. Are you getting your recommended 10,000 steps in each day? October was national walking month, here is a away for you to set a goal to walk 10,000 daily steps into the start of November. Runtastic Pedometer Step Counter & Tracker (runtastic.com). Pacer – Pedometer plus Weight Management (pacer.cc). and tracks your distance and provides a map of your journey. The Seattle Department of Transportation has a recreational walking website which offering three walking maps divided into. You can request a printed copy be sent to you: North Seattle, Central Seattle and South Seattle. So grab a family member, workout partner from the SAC or just go exploring by yourself to reach that goal of 10,000 steps each day of October and see your body change. Summer is upon us which means school is out and now you have to help keep your kids active without pushing them too hard. A summer of fun activities can quickly turn into a summer of stress and overuse injury. From various little league teams to sport camps put on by your surrounding community centers the decision of what activities are appropriate and how much your kids can handle is an overwhelming thought. Keeping your kids safe is a high priority for all parents and coaches. Keeping an open line of communication with the child and the coach is extremely important for parents to understand the mental and physical demands placed on your child’s body while participating in multiple physical activities over the summer. Kids are starting organized sports at an earlier age these days which sometimes means the size and athletic ability of your child may put them at risk when competing with others the same age. Doing a little research and talking with the coaches/instructors before just placing your children into a camp or league can give you a good understanding if that activity will be a good fit for your child. All sports have a risk of injury; some more than others. In general, the more contact in a sport, the greater the risk of injury. Concussions occur after an injury to the head or neck. They are most likely caused by body-to-body contact, body-to-object (like a ball) contact, or body-to-ground contact. Most sports injuries involve the soft tissues of the body, not the bones. Only a small percentage of sports injuries involve broken bones. However, the areas where bones grow in children are at more risk of injury during the rapid growth phase of puberty. The main types of sports injuries are sprains (injuries to ligaments) and strains (injuries to muscles). Many injuries are caused by overuse. Overuse is when a child overdoes it (by pitching too many innings, for example). This places stress on the tendons, joints, bones, and muscles and can cause damage. Wear the right gear. Appropriate protective equipment may include pads (neck, shoulder, elbow, chest, knee, and shin), helmets, mouthpieces, face guards, protective cups, and eyewear. Increase flexibility. Stretching exercises before and after games can help increase flexibility of muscles and tendons used in play. There are a wide variety of stretch assisting tools available such as the foam rolls or stretch bands which can make stretching more fun for your kids. Strengthen muscles. At a young age the focus will be on general motor patterns and as the athletes get older the exercise will consist of more sport specific movements and overall increase in major muscle development. Conditioning exercises during practice and before games can help strengthen muscles used in play but you may also need to supplement their activities with a specific strength training program. Gyms such as the Seattle Athletic Club offer summer strength training programs for all ages and skill levels all year round. Use the proper technique throughout the season of play. Depending on the sport your child’s attention to details and technique will help them decrease risk of injury. Take breaks. Rest periods are important during practice and games to reduce the risk of overuse injuries. During the year, a 2-month break from a specific sport is recommended to prevent overuse injuries. Going from school organized sport right into summer league can attribute to overuse injuries because there is not adequate recovery from the stress of the port. Play safe. There should be strict rules against headfirst sliding (in baseball and softball), spearing (in football), and body checking (in ice hockey) to prevent serious head and spine injuries. Drink plenty of proper fluids before, during, and after exercise or play. Decrease or stop practices or competitions during periods when the combination of excessive heat and humidity approaches dangerous levels. Stop playing if lightning is detected within a 6-mile radius (follow the “5 second per mile” rule). It’s also important to make sure your child has a complete physical exam by your pediatrician before participating in any sport. Most organized sports teams require an exam before a child can play. These exams are not designed to stop children from participating, but to make sure they are in good health and can safely play the game. Keep your children active with a variety of activities. The variety will allow for a well rounded development of athletic ability. The variety will also allow for your children to recover from any excessive demands placed on specific body parts during a sport season. If you have specific questions about your child’s fitness development or how to keep them injury free please contact personal trainer Jason Anderson at the Seattle Athletic Club.